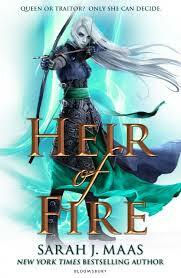 This is the third book in the Throne of Glass series. I'm not entirely certain but I think this may have been my favourite one yet. In this book we see so much more of this world. We see how others live who are not in the same land, they haven't been subjected to the same laws or threats but have dangers that are entirely their own. I loved that there were even more creatures in this book. More witches, more fey, more wyverns just more. So brilliant. There was also more of Celaena's past. Having read the Assassin's Blade before this book I was expecting to know most of what was relevant of her past. There was more, so much more, and I loved it. I also liked that there were more view points in this book. Not just the characters that had been in the last books but some new. It was very interesting to see from these new perspectives. I loved the character of Rowan. Not sure what it is about him but I loved how the relationship there builds. Brilliant. Queen of Shadows the fourth book in this series will be released in september and I will be anxiously awaiting it.